Oil pressure gauge 0-60 24v assembly M151 & M151A1. 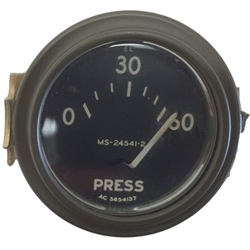 Oil pressure gauge 24v assembly NOS A/C manufacture 0-60 M151 M151A1 Early type. Also correct for late M38A1 contract jeeps with Packard connectors.